IMPORTANT NOTE: Below you may find untouched before and after photos of patients who have granted permission to their surgeon to show them anonymously. While we protect the identities of our patients, please be advised that by their nature, these photos contain sensitive content. You can be confident you’ll experience extraordinary plastic surgery results at Setty Plastics and Aesthetics in McKinney, TX. Dr. Setty is well known for his stunning transformations, and is recognized by Realself as a “Top Doctor” for breast and body contouring procedures. In McKinney, breast lift patients who have lost breast fullness and shape can combine their lift with a breast augmentation to gain more volume and a youthful appearance. Dr. Setty is one of an exclusive group of doctors to offer his patients the latest in breast implant technology with the new IDEAL IMPLANT® Structured Breast Implants. While a breast lift in McKinney can make your breasts perkier and higher, it can’t make them bigger. After pregnancy and breastfeeding, you may want to increase the size of your breasts as well as lift them. When you combine a breast lift with an augmentation and use the IDEAL IMPLANT, you can get the shape and size you want, along with peace of mind. The IDEAL IMPLANT was designed to give women the look of silicone gel with the safety of saline inside. Unlike unstructured saline implants that tend to wrinkle and ripple, the IDEAL IMPLANT is internally supported by a series of nested shells. This unique design helps eliminate wrinkling and rippling, and allows the implant to naturally move with you while maintaining its beautiful shape. Dr. Setty can give his patients optimal improvements in the fullness and skin laxity of the breasts with a breast lift and augmentation. In these photos you’ll see a 35-year-old woman who underwent a bilateral breast lift with augmentation. She chose the IDEAL IMPLANT filled to 415cc in both her right and left breast. This patient and Dr. Setty are both very pleased with her results. Women with breast implants want to know their implants are intact at all times. Unfortunately, silicone gel implants don’t allow for that. Silicone gel implants can experience “silent rupture,” which means women can have a rupture in their implants and not know it exists. In a 2017 independent survey of 933 women, 98% of women reported they would be somewhat concerned to constantly concerned about silent rupture with silicone gel implants, with 73% saying they would be very concerned or constantly concerned. You deserve an implant about which you don’t have to constantly stress. When you select the IDEAL IMPLANT for your McKinney breast lift combined with augmentation, you’ll see if there’s a rupture just by looking in the mirror. Your implant will deflate slightly, but the only thing leaking into your body will be a harmless saline solution that is absorbed safely. Recent data from an eight year study of primary augmentations shows that only 2.1% of patients with the IDEAL IMPLANT even experienced a rupture in their implants. Silicone gel implants from Allergan, Mentor, and Sientra had much higher rupture rates with 7.2-13.6% of patients experiencing a rupture based on MRI scans. The FDA recommends women with silicone gel implants obtain an MRI scan three years after surgery and every two years after that to check for ruptures. With the IDEAL IMPLANT, no expensive MRI scans are needed. You can be confident your implants are intact every day. One of the main reasons why women choose to get an augmentation and breast lift in McKinney is to look and feel more attractive. Patients who choose the IDEAL IMPLANT are highly satisfied with their end results. Results from a 6-year study published in the July 2018-Volume 142 Issue of Plastic and Reconstructive Surgery showed that after six years, 89.7% of patients who underwent primary breast augmentation with IDEAL IMPLANT were satisfied with their choice. Over 90% of patients who had replacement augmentation with the IDEAL IMPLANT were also satisfied with their results. Plastic surgeons surveyed reported a 92.6% surgeon satisfaction rate for primary augmentation and 94% for replacement augmentation with the IDEAL IMPLANT. During a McKinney breast lift combined with augmentation, the IDEAL IMPLANT is not filled to the selected size until it is inserted into the breast pocket. This allows plastic surgeons to make an incision no longer than about 4 cm, which means smaller, less noticeable scars for you. Silicone gel implants come pre-filled, which means patients who select this option have to deal with longer scars that are more visibly obvious. For your augmentation and breast lift in McKinney, you deserve an implant with a lower risk of capsular contracture. This complication happens when the body forms scar tissue around the implant, which can cause the implant to displace, become firm, and potentially cause pain. In results from an eight-year study, IDEAL IMPLANT rates of capsular contracture after primary augmentation were low at 6.6%, compared to silicone gel implants from Allergan (16.2%, 7 yr), Mentor (10.9%, 8 yr), and Sientra (11.2%, 8 yr). 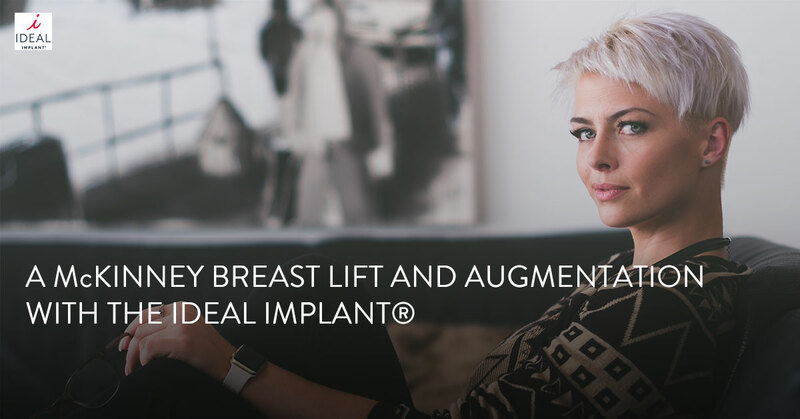 The IDEAL IMPLANT can give women the peace of mind they need, knowing they’ll have less risk of this common breast implant complication. After your McKinney breast lift and augmentation, your spectacular results won’t be visible right away. It will take awhile for your body to adjust to your new breast implants. You should avoid any exercise and strenuous activities. You may notice swelling and inflammation after surgery that may last for four to six weeks or less. You can expect to experience some pain the first week after your augmentation and breast lift in McKinney, especially if the implants were placed under the muscle. After a few months, your breasts will settle into their new position. Your beautiful, final results will be apparent anywhere between six weeks and three months after surgery. Women from all over the United States select Dr. Setty as their plastic surgeon for his impressive experience and education. Dr. Setty received his undergraduate degree from Columbia University, earned his Doctor of Medicine degree from Ohio State University, and completed his residency training in plastic surgery at Saint Louis University. He then went on to receive further training at the Institute of Reconstructive Plastic Surgery at the New York University Medical Center in New York, NY, where he finished two one-year fellowships in hand surgery and plastic surgery. With his family, Dr. Setty moved from the East Coast to Plano, TX, in 2008 where he opened his own plastic surgery practice. In 2012, he moved his thriving practice to McKinney, TX. When you come to one of his now three practices in Allen, McKinney, or Dallas, Dr. Setty wants you to feel like part of the family at Setty Plastics & Aesthetics. Dr. Setty knows how important it is for you to feel comfortable and excited about your McKinney breast lift and augmentation. He places great importance on patient education and promises to listen to all your questions and concerns throughout your plastic surgery journey. Considering breast implants in Dallas, TX? Contact Dr. Naveen Setty today to discuss your options. Simply call 214-842-6960, or visit settyplastics.com. Dr. Setty’s office is located at 175 Ridge Road, Suite 200, McKinney, TX 75070. Call today for more information on IDEAL IMPLANT Structured Breast Implants.